But if it happens at all, it’s likely to be in relatively wealthy countries with few of their own fuel sources, like Japan. Methane hydrate is found on the seabed and in permafrost, meaning extraction is expensive and quite difficult, so far at least. But it has been called the world’s largest natural gas resource. 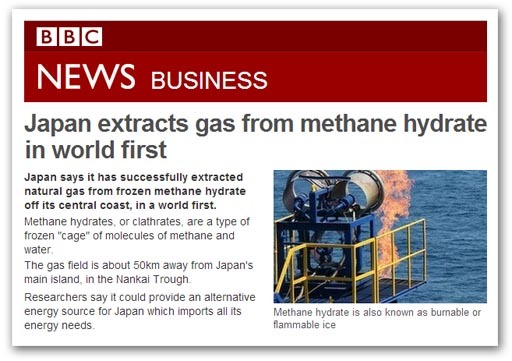 Last year, Japan succeeded in extracting an untapped fuel from its ocean floor – methane hydrate, or flammable ice, reports BBC Futures. Proponents argue that it will offset energy crises, but what are the environmental risks? Buried below the seabed around Japan, there are beds of methane, trapped in molecular cages of ice. In some places, the sediment covering these deposits of frozen water and methane has been eroded away, leaving whitish mounts of what looks like dirty ice rearing up out of the seafloor. Take a chunk of this stuff up to the surface and it looks and feels much like ice, except for a give-away fizzing sensation in the palm of your hand, but put a match to it and it doesn’t just melt, it ignites. Large international research programmes and companies in Japan, among other countries, are racing to retrieve this strange, counter-intuitive substance – known as fiery ice – from beneath the seafloor to use its methane for fuel. If all goes to plan, they may even start extraction by the end of the next decade. But the journey so far has been far from smooth. There’s no doubt that methane hydrates could offer a major source of fuel, with recent estimates suggesting they constitute about a third of the total carbon held in other fossil fuels such as oil, gas and coal. Several nations, notably Japan, want to extract it. It is not hard to find, often leaving a characteristic seismic signature that can be detected by research vessels. The problem is retrieving that gas and bringing it to the surface. “One thing that’s clear is that we’re never going to go down and mine these ice-like deposits,” says Carolyn Ruppel, who leads the US Geological Survey’s Gas Hydrates Project. It all comes down to physics. Methane hydrates are simply too sensitive to pressure and temperature to simply dig up and haul to land. They form at typically several hundred metres beneath the seafloor at water depths of about 500 metres, where pressures are much higher than at the surface, and temperatures are close to 0°C. Take them out of these conditions, and they begin to break down before the methane can be harnessed. But there are other ways to do it. Despite the caveats about Methane Hydrates being a Carbon based fossil fuel it is still a massive source of energy. It is also something that Japan needs, all the talk of moving to Renewables before it can be exploited is pie in the sky. It won’t be much longer before that bubble bursts, it is getting more & more critiscism every year. Why bother extracting it when Global Warming will release the gas – at least that is what we are told by the doomsayers. Come to think about that, how come it didn’t release during the thousands of warmer years in the Holocene Optimum? BP has hit a major milestone as first oil has been produced from its giant development in the UK North Sea. The Clair Ridge project in the West of Shetland is the second phase of development of the Clair field, which was discovered in 1977 and is estimated to contain around seven billion barrels of oil and gas. But surely methane hydrates are just a form of fossil fuels and as such (and as the green blobbery never tires of telling us) must be left in the ground lest we find a good use for it. After-all we humans are digging ape-type animals, and we all must be trained to stop quarrying for mineral resources we need to maintain our modern lives. 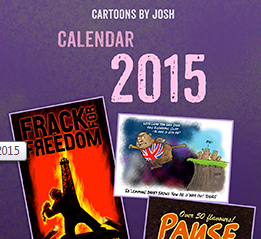 And there is also this, Fracking in the North Atlantic. Add to that all the Coal around Britain, we could be Energy Self Sufficient, sad what our Government has and is doing to us. Actually the BBC article dumbs down the reader. But that is not new for the BBC. The ice is not what’s burning. It is the gas trapped in the ice that burns. At least the article points out the fallacy in the “runaway methane” SF story plot. But it still gives credibility to the the idea of methane at the ocean bottom being able to cause a tsunami. A crap article, but better than most the BBC produces when it comes to energy or climate. Great find, by the way. A lump of ice containing some concentrated gas – where’s the fossil?